Crunchbag linux … i think i like it! First impressions — hmmm … could be a keeper. for the terminal program alone … Crunchbag replaced gnome-terminal with Terminator. 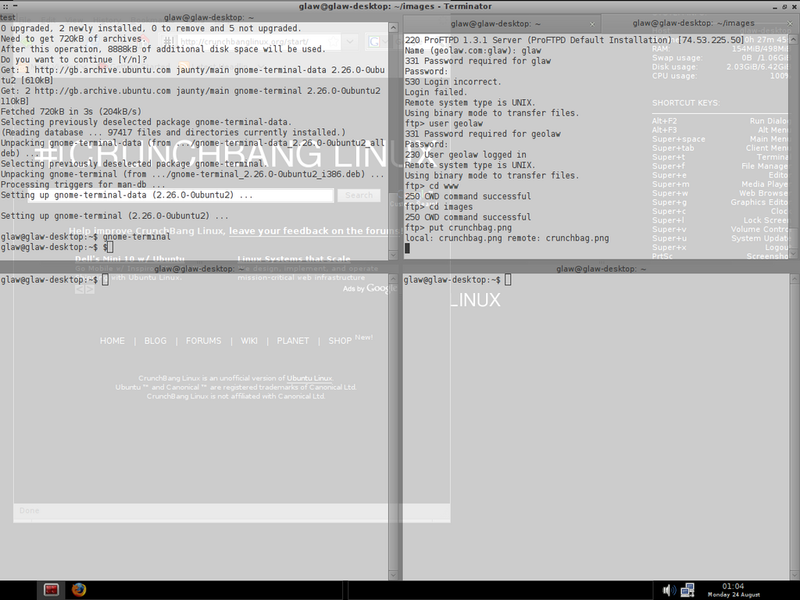 Took me a while to get used to it, but I think its going to become my primary terminal program. Quick Intro: Say you go to the ABC website and want to get the contents of the alert at the top of the page, which is enclosed in a <div> with the class “alertContent”. So a couple weeks ago I logged into Bing! to add @viewdm’s listing on their new map feature. I updated the listings it found in Upstate SC – based on the office phone listing and another listing we had while we were all getting started. I got 2 letters in the mail the other day with the PIN codes that I needed to complete the verification. It contained the URL : https://llc.local.live.com/listingcenter.aspx and instructions to go there, login, and enter the code. DOH! Most people are going to see the first warning and bail out. ARGH! Their incompetence even shows in their web practices!